The exercise of discretion in the criminal justice system and related agencies often plays a key part in decisions which are made, but definitions of discretion are not clear, and despite widespread recognition of its importance there is much controversy on its nature and legitimacy. 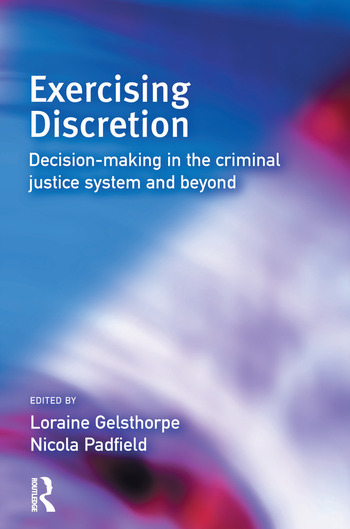 This book seeks to explore the importance of discretion to an understanding of the nature of the 'making of justice' in theory and practice, taking as its starting point the wide discretionary powers wielded by many of the key players in the criminal justice and related systems. It focuses on the core elements and contexts of discretion, looking at the power, ability, authority and duties of individuals, officials and organisations to decide, select or interpret vague standards, requirements or statutory uncertainties. Loraine Gelsthorpe is a University Senior Lecturer at the Institute of Criminology, and a Fellow of Pembroke College, University of Cambridge. Nicola Padfield is Senior Lecturer in Law at the University of Cambridge, and has published widely on criminal law, sentencing and criminal justice. She sits as a Recorder in the Crown Court, and has been editor of Archbold News since 1996.